Veterans Day is a day to honor America's veterans for their patriotism, love of country, and willingness to serve and sacrifice for the common good. Take a moment out of your busy Monday to thank a veteran! A thoughtful post and rightly so. We have much to be thankful for in November and this day to remember our veterans is very special. Happy Veterans Day and happy Monday Mellow Yellows! Beautiful Autumn tones and light round the flag. 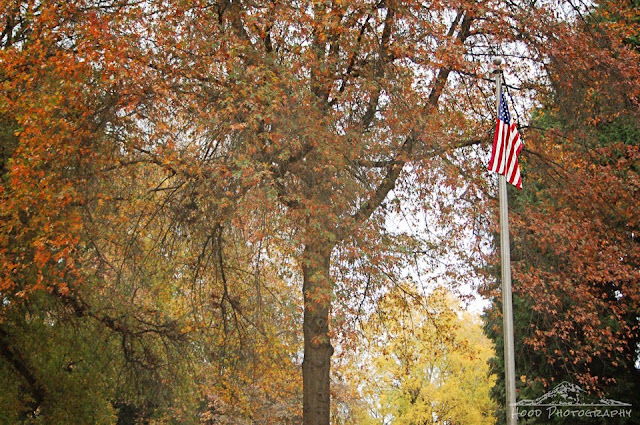 The American Flag always looks pretty when displayed...Thank you for remembering and honoring our veterans today. Nice fall colors and a good reminder of what today is all about. Great post for Veterans Day. Thank you.